In the first of a series of ads set to hit magazines in April, Blake Lively is a knockout in her first photo as the new face of Chanel. She actually makes me want to own everything she has on, and that bright red back is certainly no exceptions. 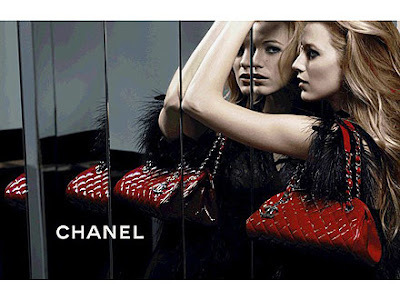 The photos were shot in Chanel's Parisian Headquarters by none other than Karl Lagerfeld. All I'm saying is I'm grateful I subscribe to both Vogue and Harper's Bazaar, because I don't want to miss a single ad from this campaign. Make sure to come back and read about Paris Fashion Week and see Chanel's Fall 2011 collection later on this week! Until then, fall in love with Blake & Chanel.